*Photos and press release courtesy of State Fair Meadowlands. I have lived in NJ my entire life (except when I was away for college) and I have NEVER been to the State Fair at the Meadowlands. I've always kind of felt like I've been missing out. I mean... there are pig races! I seriously don't know how I've made it this far in life without seeing a pig race. That alone would make the State Fair worth it to me. How adorable must a pig race be???? And there is fried EVERYTHING. And food on sticks! 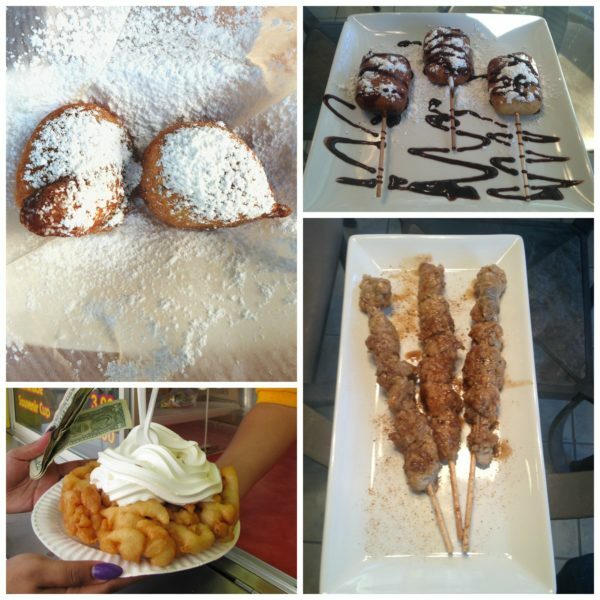 What is there not to love about food on sticks??? And the sky ride? Put me on the sky-ride and happy girl. Imagine the people watching possibilities while on the sky-ride at the New Jersey State Fair. I'd ride all day. So seriously. Give me a pig race, a funnel cake, and the sky-ride and I'd call it a successful day at the State Fair I think. But... I'm told there is a lot more to do. And with bargain days in honor of this years 30th Anniversary... this might be the year for me to go! This year the fair will open on Thursday, June 23, with a “Throwback Thursday” hand-stamp for just $19.86 – commemorating the fair’s opening in 1986! Plus new policies for Dollar Day and much more. State Fair Meadowlands, the largest fair in the New York metro area with over 150 rides and attractions, today announced special Bargain Days and advance ticket deals for this year’s 30th Anniversary fair, which runs from June 23 through July 10 at the State Fair Meadowlands Fairgrounds, next to MetLife Stadium in East Rutherford. “We love treating fair-goers to an event full of exciting attractions and outrageous fun, at a price that local families can afford. Come and make memories on Throwback Thursday, Dollar Day, Kids Go Free Night, Cheap Cheap Night and Patron Appreciation Day,” said Al Dorso, president of State Fair Meadowlands. An entry ticket gets fair-goers access to all of State Fair Meadowlands’ exciting free entertainment, such as the brand-new Death Defying High-Dive Show, the adorable Racing Pigs, the Great American Thrill Show, Master Hypnotist Steve Bayner, daily concerts featuring pop, rock, country and Broadway singers, and much, much more. Every day, children shorter than 34 inches get into the fair for free (everyone needs a ticket to ride the rides). Opening Night Throwback Preview: Thursday, June 23, 6 pm-midnight – Gate admission is $7 for ages 13 & older; $5 for ages 12 & younger; gate admission and Unlimited Ride Hand Stamp Combo is $19.86 for all ages. Parking is $5 per carload. Dollar Night: Friday, June 24, 5 pm to 1 am – Gate Admission is $10 per person, all ages. Each ride is $2 per person, each game is $2 per person. There will be select food and drink items for $2 each. Parking is $2 per carload. Kids Go Free Night: Wednesday, June 29, 4 pm-midnight – Any child 12 and younger gets into the Fair for free; a savings of $8 per child! There will be an Unlimited Ride Hand Stamp available for $20. For persons 13 & older, gate admission is $10 and there will be an Unlimited Ride Hand Stamp for $20; Combo Ticket for adults is $30. Parking is FREE. Cheap, Cheap Night: Wednesday, July 6, 4 pm-midnight – Gate admission is $5 per person, all ages. An Unlimited Ride Hand Stamp is offered at $19 or you may purchase a gate admission/Unlimited Ride Hand Stamp Combo $24. Parking is FREE. Patron Appreciation Day: Sunday, July 10, 2 pm-midnight – A Pay-One-Price Combo Ticket for gate admission and an Unlimited Ride Hand Stamp is available for $30 per person. If you do not ride the rides, gate admission for persons 13 & older is $11; gate admission for children 12 & younger is $9. Parking is $5. Bargain Night Policies – The Advance Sale Mega Pass is NOT Valid on DOLLAR NIGHT, Friday, June 24. Unlimited Ride Hand Stamp excludes Live Animal Rides and Special Attractions such as the oddity shows and the Batcopter. Gate Admission is FREE any day for children under 34”. But, everyone needs ride tickets to ride the rides. Please check height requirements for each ride before purchasing a hand stamp or individual tickets. Advance Sale Tickets – Purchased in advance, a Mega Pass is $26.97. An adult admission ticket, for those 13 and older, is $7.97. A child’s admission ticket, for those 12 and younger is $5.97. Buy online through June 20 at www.njfair.com. FREE Rain Assurance – If it rains continuously for more than 30 minutes before 9 p.m., warranting the closure of the majority of rides and entertainment, State Fair will validate ticket stubs with a stamp that will be good for any other weekday of the Fair (offer not valid for Dollar Day, Friday, June 24 or Closing Night, Sunday, July 10). PLEASE NOTE – The Fairgrounds will be closed to the public on Sunday, June 26 for a soccer event at MetLife Stadium. This year, the fair is proud to be showcasing over 50 food vendors plus a wide range of family entertainment that is FREE with entry ticket to the event. New this year is The Death-Defying High Dive Show, which features an 80-foot high dive tower from which daredevil divers plunge at 50 miles per hour into a 9 ½-foot pool. Don’t miss the “Fire Dive” during the last show each day. Other exciting entertainment includes The Great American Thrill Show – an open-air performance of gymnastic acrobats and aerialists, dazzling audiences on the high wire and 90-foot sway pole. Back by popular demand for their 28th year will be The Racing Pigs. Throw your arms in the air and cheer them on as they rip up their real piggy racetrack! The well-loved Master Hypnotist Steve Bayner will be back daily on the Main Stage. Hypnotist Bayner manages to be silly and amazing at the same time; take your chances and get up on stage with him. The fair will also hold a wide range of concerts featuring national headlining acts on the American Stage. Visit the njfair.com website for concert information. State Fair wouldn’t be State Fair without the free Educational Petting Zoo, where kids can get up close and personal with animals of the world – a perfect spot for ridiculous selfies. Like all the other entertainment, the Petting Zoo is free with entry ticket. 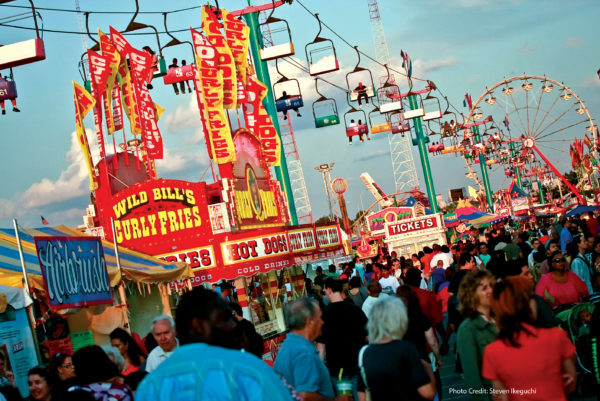 State Fair Meadowlands has over 50 exciting rides and the largest Kiddieland in New Jersey. A family favorite, the Sky Ride, is back this year, providing sky-high views of the fair and NYC skyline, and for Batman fans, the Batcopter will provide rides with panoramic views of the fair in the original helicopter from the 1966 TV series. State Fair Meadowlands occupies over 35 acres of fairgrounds plus parking. Regular fair hours are Monday through Thursday, 6 pm to midnight; Fridays, 6 pm to 1 am; Saturdays, 2 pm to 1 am; Sundays, 2 pm to midnight. Special hours are: Preview Night, Thursday, June 23, 6 pm to midnight; Dollar Day, Friday, June 24, 5 pm to 1 am; Sunday, July 3, 2 pm to 1 am; Monday, July 4, 2 pm to 1 am; Kids Go Free Night, Wednesday, June 29, 4 pm to midnight; and Cheap-Cheap Night, Wednesday, July 6, 4 pm to midnight. The fair is closed to the public on Sunday, June 26. The fair will again be offering free shuttle buses from/to Secaucus Junction; check www.njfair.com for details.